Is there more than one charophyte alga in the Rhynie chert ? In view of the fact that no living plant can be regarded as a close relative of one of the 7 "higher" terrestrial plants discovered hitherto in the Rhynie cherts, it is surprising that the green alga Palaeonitella looks rather similar to extant Nitella, a water weed of the stonewort clade, indicating that evolution was very slow in this branch of charophyte alga for at least 400 million years. Palaeonitella cranii was first described in 1921  without the characteristic fruiting bodies (oogonia), which are called gyrogonites because of their twisted appearance. 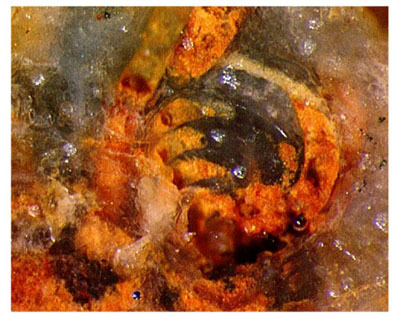 The gyrogonites of Palaeonitella were discovered only recently, which gave rise to a re-evaluation of the species . Fig.1: Upper whorls of Palaeonitella, silicified while standing upright in the water. Incidentally, the big tube-like cells making up the plant remained hollow. Width of the picture 5mm. 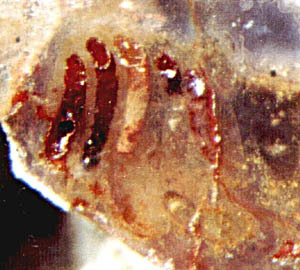 Fig.3 (below right): Spiral object seen on a cut but not polished chert face; width of the picture 1.1mm. Photographs Figs.1,3: H. Sahm. 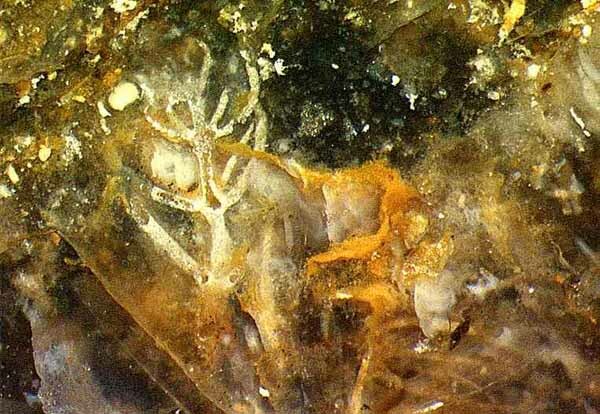 Fig.2 (right): View into a spiral object cut nearly lengthwise, tube-like cells (or cast of their inner hollow) seen in clear chalcedony; width of the picture 0.85mm. 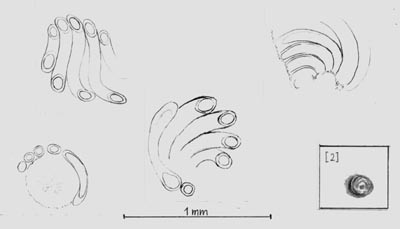 Fig.4 (below): Drawings of several enclosures consisting of spirally wound branches, including those of Figs.2 and 3, from the same chert sample, partially idealized for better visibility. Note their big sizes compared to the gyrogonite after . In Fig.2, the oddly wound members fit closely together on the left and above, the apparent gaps being due to the fact that in some places only the formerly hollow and later filled interior of the tube-like cells is seen in optical contrast, but there are real gaps between the cells on the right. These chiral objects seem to consist of 5 or 6 wound branches (= cells) whose arrangement does not show any symmetry and does not form a closed space. Apparently the branches form some kind of partial enclosure. As the size of the chiral objects is comparable with that of the antheridia described in , they could possibly serve as protective baskets for antheridia, a feature not observed before. Can P. cranii be so variable as to bring forth such uncommon forms or is it a new species ? In view of the current opinion that “there is no evidence of the presence of more than one species of charophyte in the Rhynie chert” , p 451, this would be interesting news. Anyway, the wound structures illustrate how the gyrogonites could have evolved from whorls of branches with a twist: In the course of evolution, the whorls protecting the oogonia apparently contracted into tightly fitting capsules while those wound around the antheridia preserved an ancient state of partial cover. Trans. Roy. Soc. Edinburgh 52(1921), 855-902.